Nitt Witt Ridge, as viewed from the street. A decorative archway at Nitt Witt Ridge. On the central coast in the town of Cambria, just a few miles from San Simeon, there's a place called Nitt Witt Ridge. Some locals call it "the poor man's Hearst Castle," but it's every bit as fascinating. We stop by to discover this little-known California historical landmark, and the man who brought it to life. The California Report's Diane Bock brings us his story. Back in the '20s, carpenters, stonemasons and plasterers flocked to the Central Coast. They came to build William Randolph Hearst’s La Cuesta Encantada — you might know it as Hearst Castle. At the same time, a man named Art Beal began to single-handedly create his own enchanted castle. 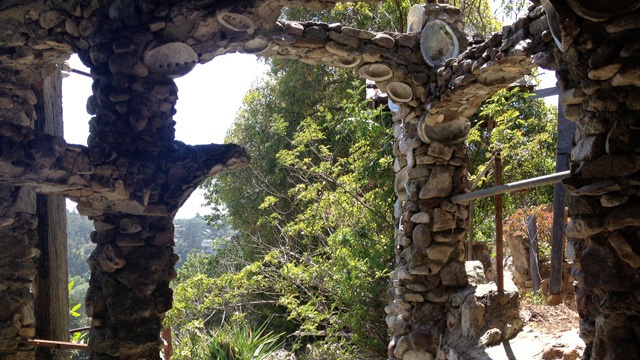 Today, like Hearst Castle, Nitt Witt Ridge is a state historic landmark. But the similarities end there. 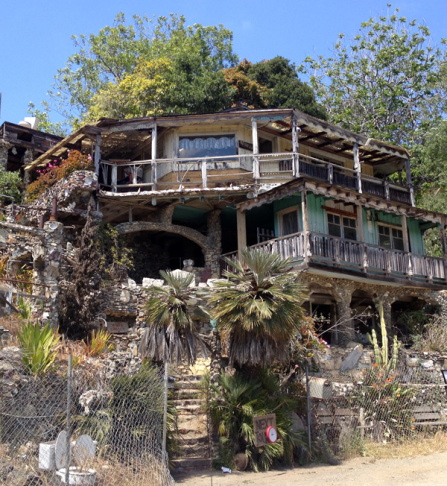 The striking three-story structure is a quirky hodgepodge of beach stones and beer cans, tire rims and toilet seats — castoffs Beal collected during his stint as Cambria’s garbageman. His folk art masterpiece sits behind a locked gate in a quiet residential neighborhood. Vicki Hogue is visiting the area with her friend, Mary Bestgen. “Actually, we just happened upon it because we were driving by,” Hogue says. A clock hanging on the gate shows the next tour at 1 o’clock. At 1 on the dot, Mike O’Malley appears. O’Malley bought Nitt Witt Ridge 15 years ago. He doesn’t live on the property, but he’s here every single day just in case someone stops by. O’Malley maintains that feeling by keeping Nitt Witt Ridge in a state of arrested decay. Uneven concrete steps lined with abalone shells lead us through stone-covered arches to a jumble of rooms lined with flaking plaster and peeling wallpaper. Some rooms are like time capsules — nearly untouched. Beal was born in Oakland in 1896. He never knew his father, and his mother, a Klamath Indian, was killed in the 1906 San Francisco Earthquake. Beal was then sent to an orphanage. When he was 17, he joined the merchant marines. He went on to become an award-winning long distance swimmer, a vaudevillian, a sous chef and a poet. Beal moved to Cambria in 1928. Legend has it that he arrived with a woman named Gloria. When she left a few years later, it broke Beal’s heart, and he threw himself into constructing his dream home. In 1977, Beal was featured on the television show "Real People," and O’Malley plays the tape as part of the tour. He switches on a small TV and VHS player that’s powered by his car battery, and suddenly Beal is in the room with us. The four-minute segment portrays Beal as equal parts cantankerous crackpot and creative free spirit. It ends with Beal reading one of his poems. Beal died in a Morro Bay rest home in 1992. He was 96. His ashes were scattered beneath a redwood tree on Nitt Witt Ridge.